Mitglieder der Kultusgemeinde Themar, 7 März 1938. Research in public and private, family archives, as well as in the databases made available in the increasing number of genealogical websites (such as Ancestry.com and MyHeritage, etc), are allowing us to identify and document the presence of the Jewish citizens of Themar. At present, October 2015, the number of Jews who were born or died in Themar or who lived for some significant period of time in the small city is over 370. The full list is available here. Most of the members of the Jewish community lived in the family groupings identified here. And individuals who at first glance might seem to be outside of families can often be identified as relatives of families: Klara Eisenfresser, for example, was the sister of Karoline Mayer, née Eisenfresser. Klara came to Themar sometime in the late 1920s or early 1930s and stayed until she left with her sister for Berlin, where the two women, both in their 90s, died in 1940. Nanny Steindler, née Rindsberg, was the mother of Pauline (née Steindler) Müller, co-owner of the S. M. Müller department store. Bertha Nussbaum, née Stern, whose name appeared on the list of the Jewish community of January 17, 1939, was the mother of Clara Müller (née Nussbaum), and grandmother to Herbert, Meinhold and Willi. 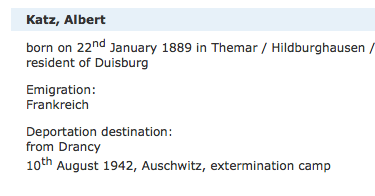 She lived in Themar for a period of time after Kristallnacht 1938 and early 1939.